Just coming on quickly to share a this virtual event for the naturally curly hair community called the Pearl & Curls eVENT!! I’ll be participating by hosting an hour-long LIVE chat session for attendees!! Pearls & Curls vision is to bring together the worldwide community of naturally curly hair lovers in one place, at one time, for a memorable experience by learning, discussing, and celebrating naturally curly hair. 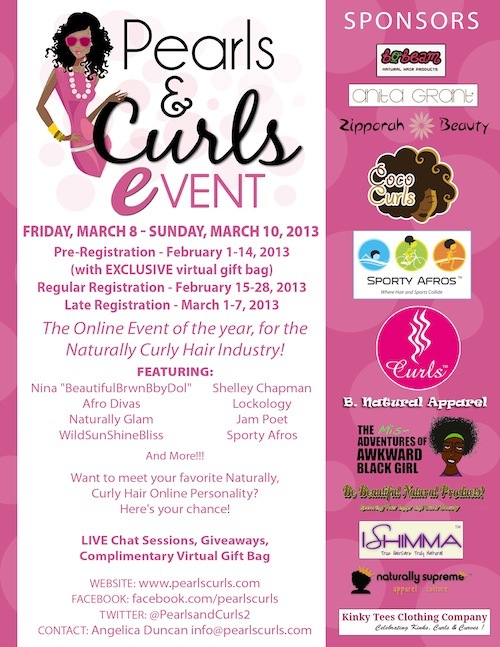 check out all the other great natural hair personalties who will be present!! And, I just learned that pre-registration has been extended to 11:59 pm tonight, February 17th!!! After today, the price goes up to $10. So, pre-register here for the low, low price of $5 and receive a complimentary Virtual Gift Bag too! For more details and updates about the event, check out PearlsCurls.com and follow Pearls & Curls on Facebook and on Twitter.